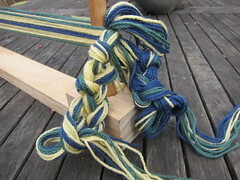 First up is to decide on the length of your finished tablet woven band and the colours you want to use, then calculate your warp length and measure and cut the warp threads. The length of warp needed is the required finished length multiplied by 1.2 plus 50cm loom waste allowance. The 1.2 multiplier accounts for the shortening effect of the warp threads twisting around one another and intertwining with the weft threads. 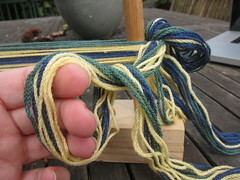 The loom waste consists of the space needed for the tablets and the length used in tying the warp to the loom. 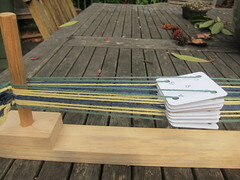 All the warp threads should be measured and cut before starting to thread the tablets and warp up the loom. eg. 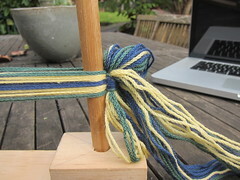 For a 1m finished product of the pattern above we would need 1.7m long warp threads (1m x 1.2 + .5m), 10 in yellow, 8 in green and 14 in blue. 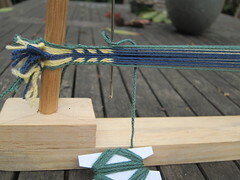 The weft thread should ideally be the same yarn as the edge warp threads. In this pattern we need 8 tablets. To thread the tablets begin with number 1. Reading down the column you can see we need 4 threads of the same colour and that they need to be S threaded. 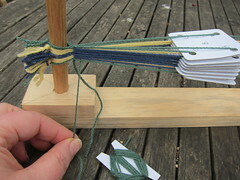 For S threading, thread from the front of the tablet and gather them together behind the tablet. 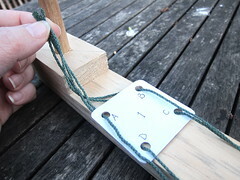 Tie a knot and place the loop over the dowel at one end of your loom, A and D threads on one side, B and C on the other. 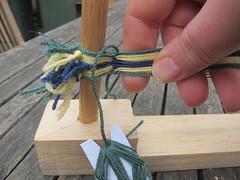 Take the loose ends of the warps and tie them off at the other end of your loom with an overhand knot (the first part of tying a bow), we’ll tie each warp off separately this way and then once all tablets are warped they can be tied in a single bow. Each tablet is threaded in turn and laid on top of the previous one. 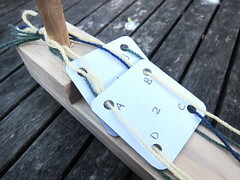 For Z threading, thread from the back of the tablet and gather the warp threads together in front of the tablet. 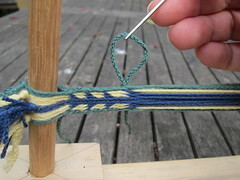 The image of tablet 6 shows what a Z threading looks like. 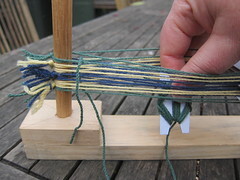 The tension on all the threads needs to be nice and even to get the best results from your weaving. 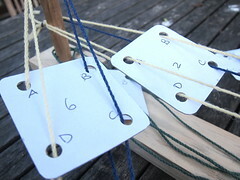 Adjust the tension of each tablet’s warps one at a time, gathering the loose ends of the warps together in bundles of A+D threads and B+C threads as you go, then tie them all into a single bow. 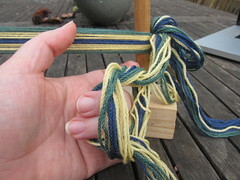 Keep the extra warp threads neat and tidy by chaining the warp – make a loop near the dowel, then pull the trailing warp through to make another loop, this then becomes the loop through which you pull the next bit of warp and so on until it’s all bundled up and can’t get tangled or tripped over or attacked by the cat. 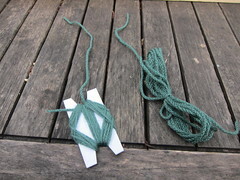 A turning pattern of “All Forward” indicates that all tablets are turned together in the same direction, forward, one 90 degree turn for each pick (pass of the weft thread through the shed). This being an “All Forward” pattern, as you weave, the warp threads in the unwoven section of your work will twist around one another eventually becoming too twisted to allow further weaving. The easiest solution to this is to simply reverse direction and turn “All Backward” which in this case will result in arrows pointing in the opposite direction. You can see a few reversal points on the band in the photo above the pattern. Patterns that have a turning sequence of “4 Forward, 4 Backward” do not suffer from this problem. The weft thread can be wrapped around a small shuttle or simply wound into a small loose hank. 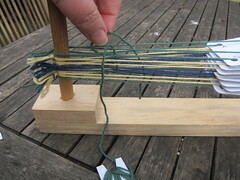 To begin weaving place the weft through the shed leaving enough trailing end to allow it to be threaded back through the band on the next pick. 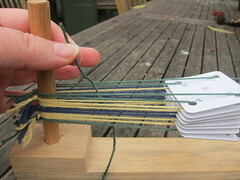 Turn the tablets, pass the weft back through the shed and also pass the trailing end through the same shed in the opposite direction (this secures it so it won’t unravel when you take the work off the loom). Turn the tablets again, tighten the weft threads, then beat the weft into place. I just use my fingers for this though I’m told the back of a knife blade works well too. Continue by repeating the following sequence: pass the weft through, turn the tablets, beat, then gently tug the weft in close to the edge. 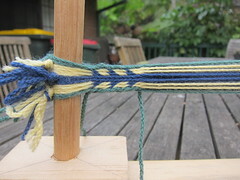 Try to be consistent with how tight you pull the weft in as this will affect the width of the woven band. 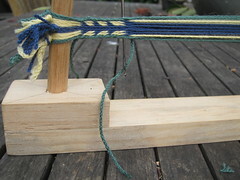 The warp threads will not all be woven in until a full rotation of the tablets (4 forward turns) has passed, so it can be hard to get the weft tension right to begin with. 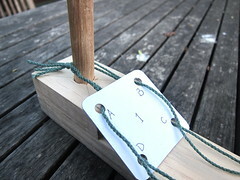 On your second last pick you can place a large eyed needle in the shed with the weft such that after the last pick has been woven you can thread the needle with the loose end of the weft and draw it back through the second last shed in the band to secure it in the same way as it was secured at the beginning.